Enjoy a large beautiful Pool with Clubhouse, walking trails, open spaces, and two tot lots! Three hundred beautifully crafted new homes will grace the rolling landscape of this new community in Rolesville. From the acorn embellishments on the wrought iron lamp posts to the two-story clubhouse and swimming pool, Carlton Pointe puts everything at your fingertips. Take a stroll on the walking trails or just sit and watch the sunset from the front porch of your new home– Carlton Pointe provides an appealing neighborhood ambiance to fit your lifestyle. – Murdock & Gannon, Inc. Discover a new home lifestyle in Rolesville! The town of Rolesville, North Carolina — celebrating our past, embracing our future! Rolesville, NC—one of the Research Triangle Region’s best‐kept secrets. Situated on US Hwy 401 in northeastern Wake County, our community offers residents and businesses easy access to one of the strongest regional economies in the U.S. without all the congestion associated with major metropolitan areas. Actual schools may vary. Contact us for more information. 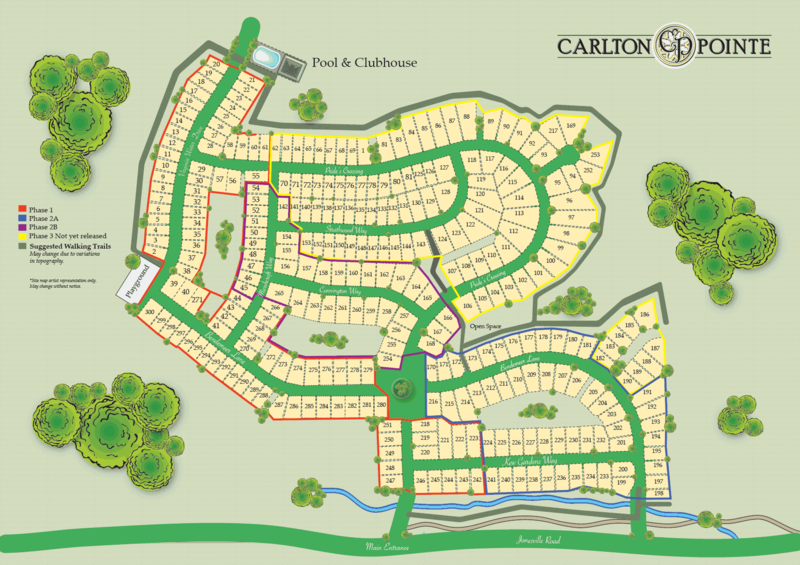 Carlton Pointe is located minutes to Main Street Park which has four rentable shelters, a gazebo, open play field, playground and over one mile of greenway trails. Mill Bridge Nature Park has a 200 seat amphitheater along with greenway trails that currently connect with the Wake Forest Parks & Recreation greenways and have future plans to connect with the current greenway trails at Main Street Park. From I-540, North on Hwy 401/Louisburg Rd to just inside Rolesville town limits, right on Jonesville Rd, left into the subdivision on Prides Crossing.